In the previous sessions of ADO.NET video series, we have learnt about SqlDataReader. SqlDataReader is connection oriented, meaning it requires an active and open connection to the data source. SqlDataAdapter and DataSet provides us with disconnected data access model. 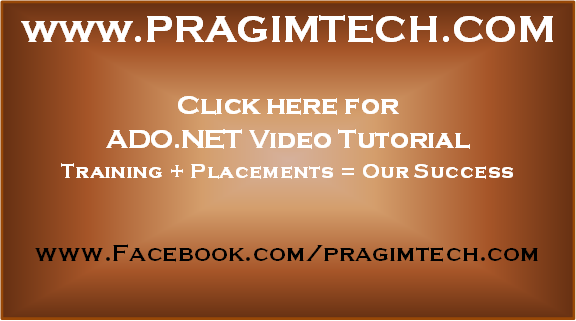 In this part, we learn to use SqlDataAdapter and DataSet objects. In a later video session, we will discuss about, where the disconnected data access model can be used. In Part 4, we have discussed about SqlCommand object. When we create an instance of SqlCommand object, we pass in the following 2 parameters to the constructor of the SqlCommand class. 2. Creates an instance of DataSet object. A DataSet is an in-memory data store, that can store tables, just like a database. 3. The Fill() method of the SqlDataAdapter class is then invoked. This method does most of the work. It opens the connection to the database, executes the sql command, fills the dataset with the data, and closes the connection. Opening and closing connections is handled for us. The connection is kept open only as long as it is needed. 5. Finally the DataBind() method is called, which binds the data to the control. // and fills the dataset with data, and finally closes the connection. If you want to execute stored procedure spGetProductInventory, using the SqlDataAdapter, just specify the name of the procedure instead of the in-line sql statement. To execute stored procedure spGetProductInventoryById, we need to associate parameter @ProductId to the SqlDataAdapeter object's SelectCommand as shown below. Please upload videos regarding this as soon as possible because i face this question in an interview. Can i get the queries to create the table and the source files?